While Mitt Romney, the leading contender for the Republican nomination for president, looks to lock up his nomination during the Super Tuesday Republican primary races, some members of the black community have concerns about Mormon literature that says "dark skinned people" are from "the seed of Cain." 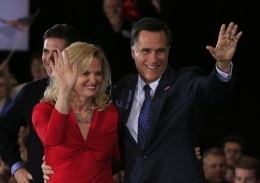 Yet Romney, who has said he is proud of his Mormon faith, said the doctrine in question has not been followed for years and was glad to see the change. What They're Saying About "Us" Mitt Romney Politics Blacks And Priesthood PriesthoodMitt Romney,Politics,Blacks And Priesthood,Priesthood,What They're Saying About "Us"